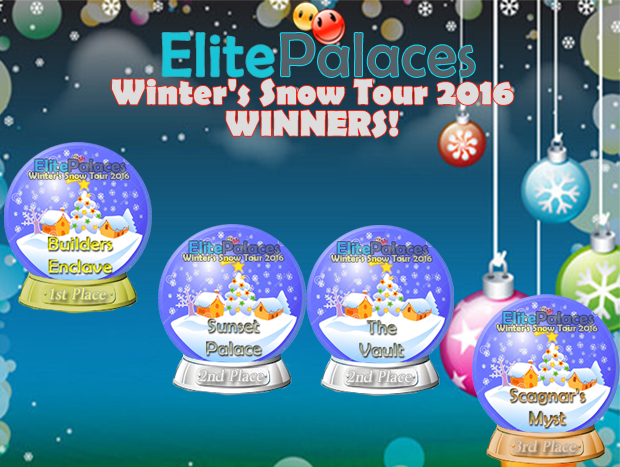 ElitePalaces Winter’s Snow Tour 2016 Winners! We are happy to announce the winners of out 8th Winter’s Snow Tour 2016! Thanks to all the palaces and visitors that participate in the event and at the party and congrats to the winners!!! You can check the judge comments and winners table at the Tour Web Site! Previous PostNew Music Script EMplayer!Next PostUpdated Script… EP Events Calendar 2017!